Oscoda, Mich — The last three regular season games between the Oscoda Owls and Mio Thunderbolts boys squads have been decided by a total of four points, and Friday night’s game was almost just as close. Give it up to the Owls for getting off to a faster start than the Thunderbolts against a tough defense. The key in the first half for Oscoda was the three 3-pointers they made. The paint was heavily guarded and Gabe Kellstrom knocked down two 3-pointers to help give the Owls the 15-12 lead at halftime. Mio answered in the third. Brendan DeFlorio made 7 of the Thunderbolts 10 points, which included a Drew Hess three giving Mio the 20-17 lead, but Oscoda took over ending the third up 25-22. 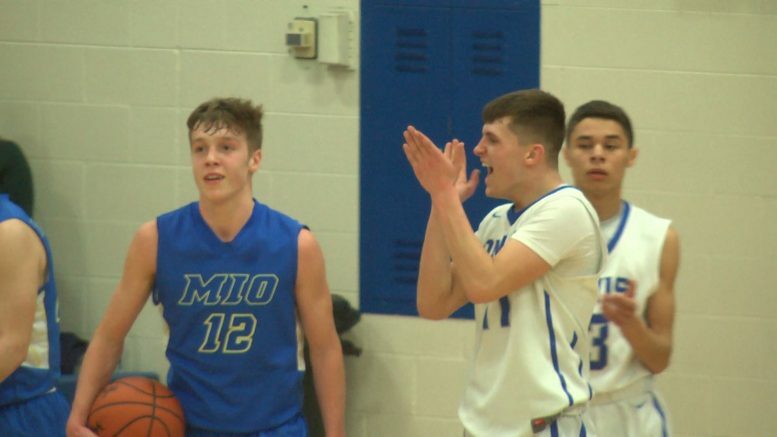 The Thunderbolts made two more threes in the fourth quarter, but Oscoda scored on their buckets and free throws to defeat Mio 41-35, improving to (14-0). Up next, the Owls are on the road in Tawas on Tuesday.